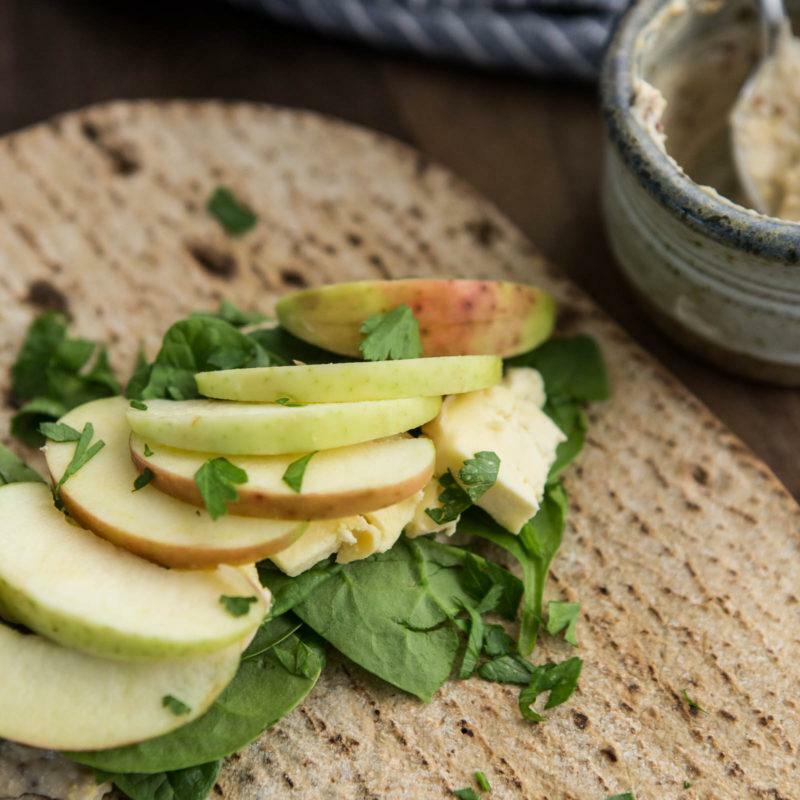 Apple Wrap with Cheese and Mustard Hummus | Naturally. Every year around the end of October, I shift gears and prepare to hunker down for winter. Even in California! Usually by this time, I have canned as many tomatoes as possible, frozen and dried herbs, and packed my crisper full of apples. My hope is that the apples will last at least a month or more. This apple wrap combines some of my favorite flavors, welcoming the cooler months but holding onto the bright days of summer. The sweetness of the apples plays with the pungent mustard and creamy cheese. In fact, it’s the perfect sweet/salty lunch any time of year! This easy wrap is perfect for fall. Make your own hummus or skip that step and use store-bought. Play around with apple varieties to find your favorite sweetness and texture. In a small bowl, mix mustard and hummus until well combined. Slice cheese and apples into 1/4 inch slices. To assemble, lay wrap on a flat surface. Spread half the hummus and mustard mixture on the wrap. Place half the spinach onto the wrap. Layer cheese and apples. Sprinkle with parsley. Roll, tucking in the sides as you go. Repeat with remaining wrap. 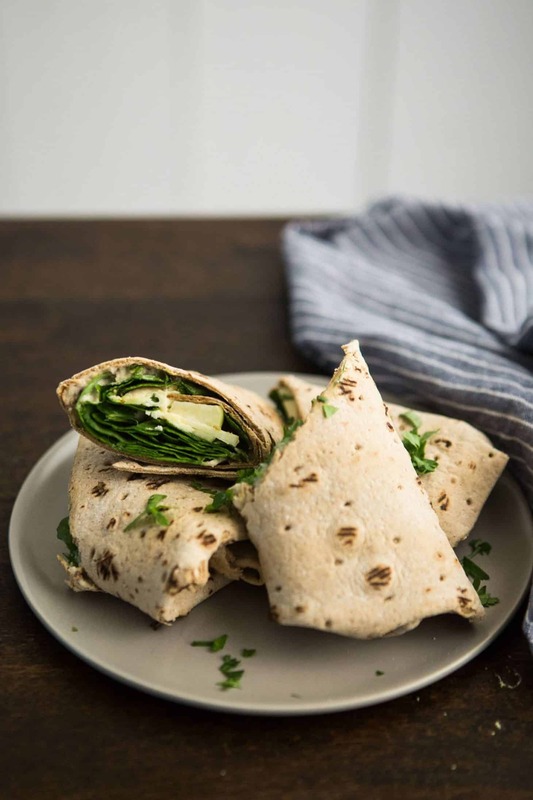 Cut each wrap in half to serve. Tips & Tricks: Use your favorite mustard and vary the amount, depending on how much mustard flavor you want the hummus to have. I love putting a lot of stone ground mustard to really get that kick! 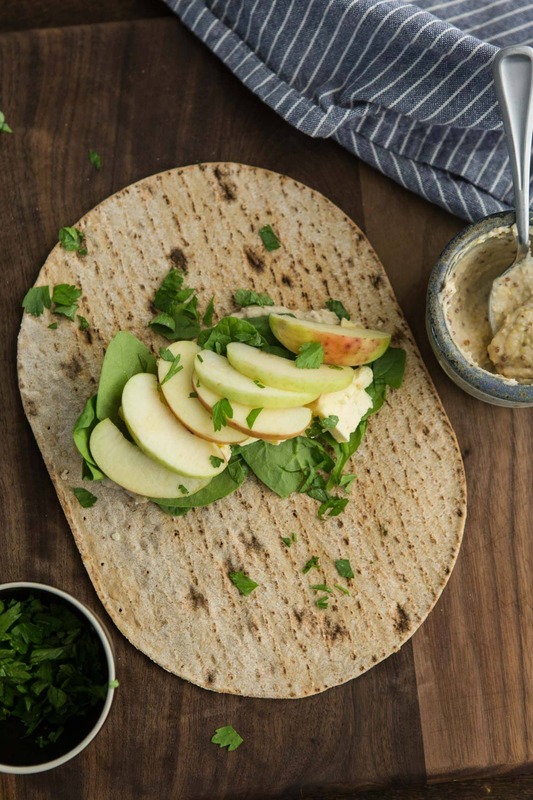 I like to balance the flavors in this wrap by using a crisp, slightly sweet apple variety (like the honeycrisp) but really, any variety will work. Also, feel free to use your favorite store bought hummus if you’re not up to making your own! Cheese: Swap out the camembert for a more mild brie or other spreadable cheese such as boursin or neufchatel. Greens: Instead of spinach, you can use other baby greens such as kale, arugula or even shredded romaine lettuce. 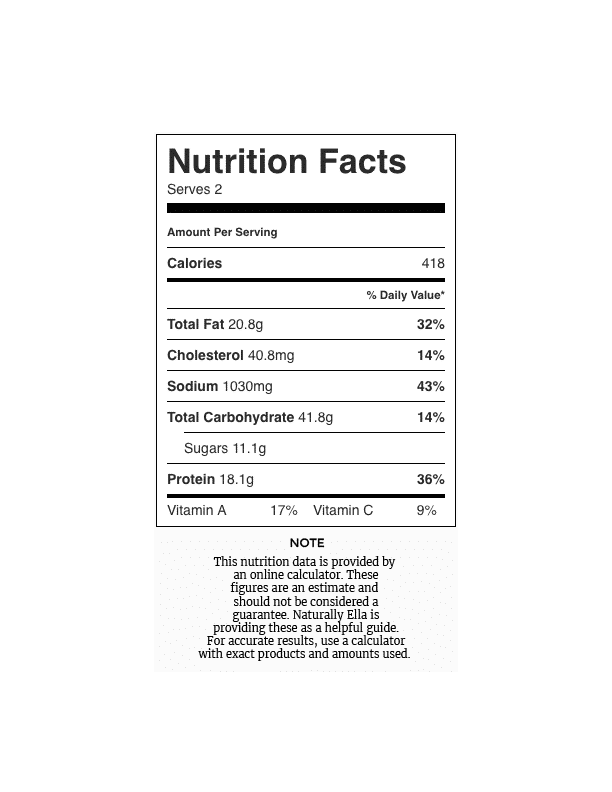 Fruit: This wrap would be delicious with other fruits such as pear, persimmon or fig. Use them with the apple or instead of the apple. Looks delicious, thanks for share. Maybe tonight!! !